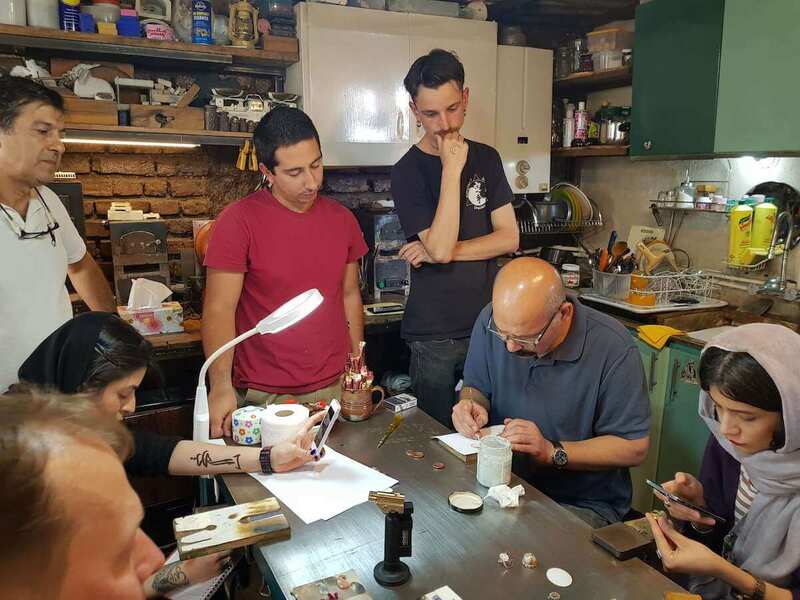 The third See you for Today’s art, presented by See You in Iran and organized by Mina Jazayeri, was a tour of Keyhan Nabaviye’s workshop, during which he talked to participants about the ancient art of Minakari or enameling and showed the attendees how the process is undertaken. At the end of his demonstration, participants stepped in and tried the techniques themselves. 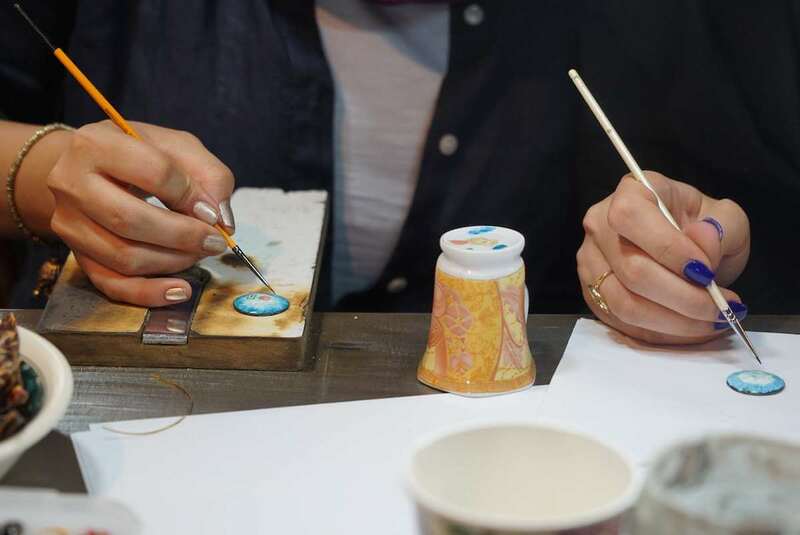 Minakari or enameling is the art of coating different bodies such as metals, ceramic and pottery with a colorful glass layer (1). this specific art form in Iran dates back to Arsacides and Sassanid dynasties which ruled Iran from 247 BC to 651 AD. Though the art form was regarded insignificant after Sassanid dynasty collapsed, it gained merit again during Seljuq empire’s reign over Iran (1037-1194). Theenameling takes place when the powdered glass is fused with another surface, usually metals such as silver gold and most recently coper and brass, in a kiln that reaches 750 to 850 degreesCelsius. The powder after melting and hardening forms a smooth and transparent layer which will be painted on using Eslimi patterns or other techniques. To find out how the complicated process is done check out the links at the end of the report. 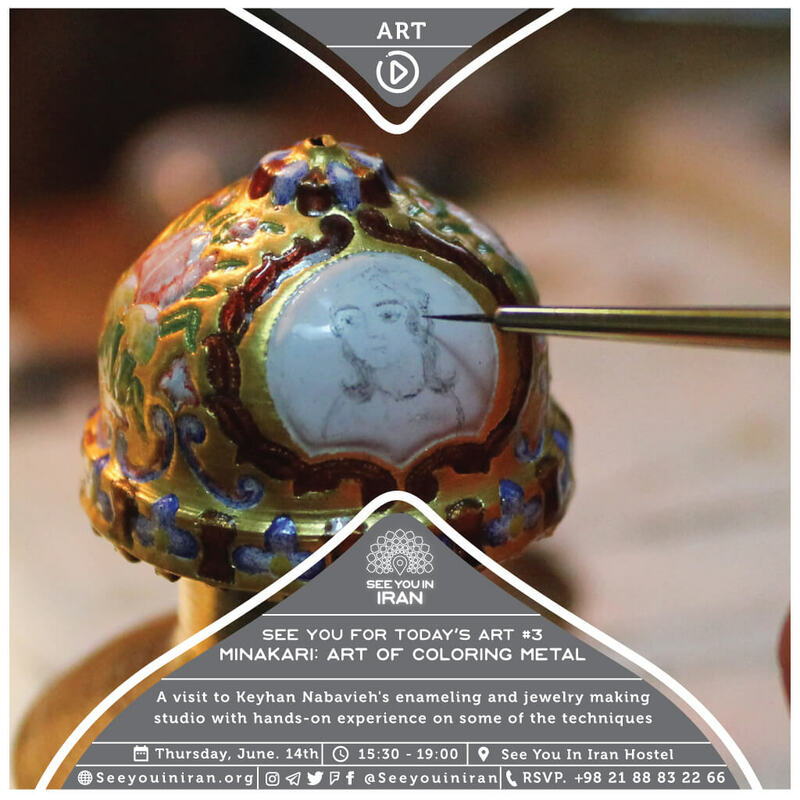 Keyhan is a passionate artist who has experience in many fields of archaic arts including Miniature, Minakari, Tahzib (illuminated manuscript), pottery, sculpture and so on. 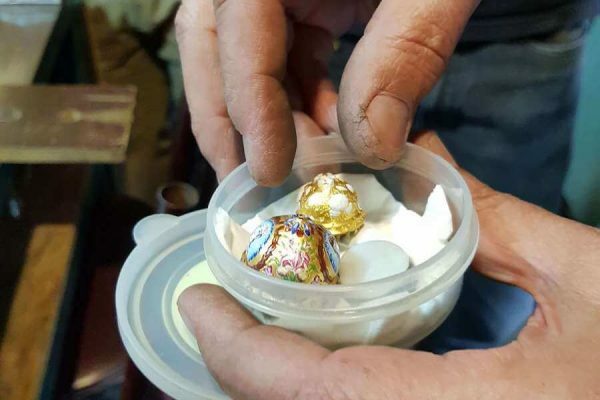 He has always been interested in jewelry design using authentic Iranian techniques. He started crafting wooden rings when he was 5, using nothing but a knife, and later on became a student of famous masters of the art throughout his education. 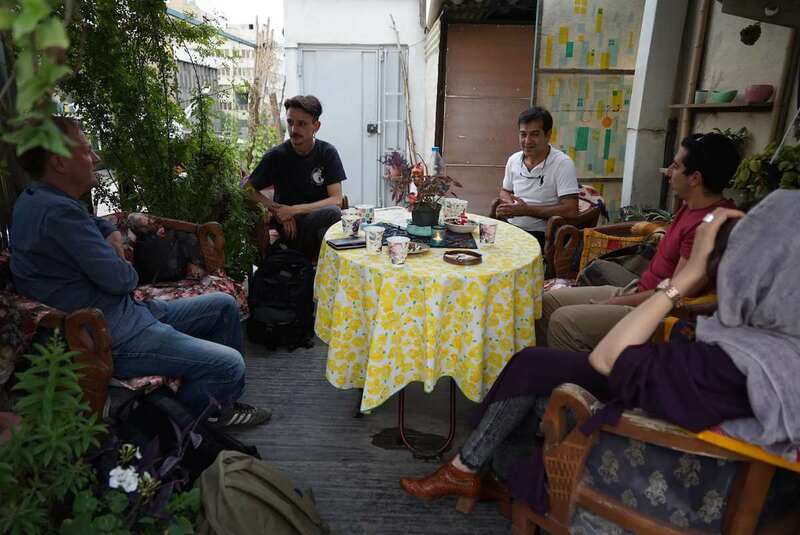 Keyhan and his colleagues in the workshop, which is located on a rooftop of a building around Ferdowsi Sq in Tehran, warmly welcomed us on a torrid summer day by serving chilled Iranian sherbet, called Sekanjebin, while Kehyan explained the journey of how he became a craftsman and the things he’s stumbled upon throughout his 40 yearlong path. He demonstrated to the participants, from the scratch, how the process is done. 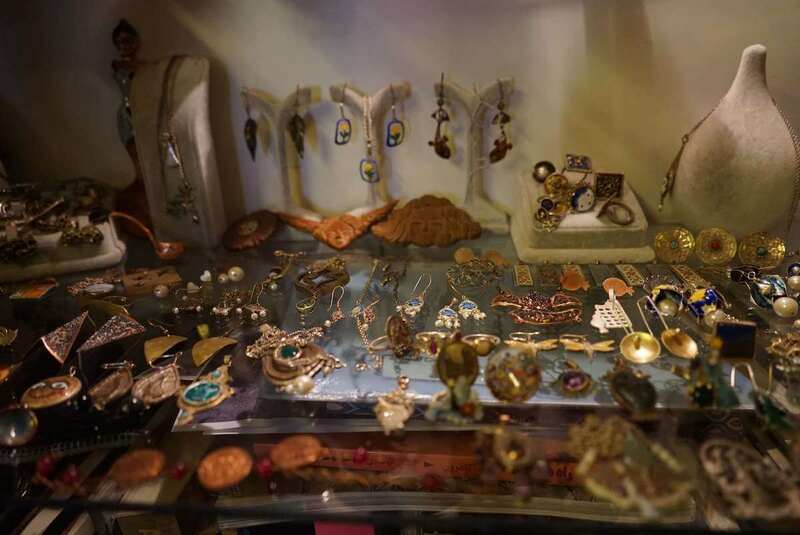 His style of Minakari is used to embellish gold, silver and copper-based jewelry. Afterwards the participants were given a brass coin to experience Minakari first hand. After putting the coin through the kiln, the enameled surface was prepared for our group to start painting on. Depending on the variety of colors and the sophistication of the painted design, the coin must go through the kiln number of times so the colors remain distinguished. Two of our female participants were inquisitive students of the art from Tehran who claimed to have looked for the style of Minakari that Keyhan is a master of, for quite some time. They have even travelled to Isfahan in search of that style. After realizing See You in Iran is organizing a Minakari workshop, they became intrigued and traveled to Tehran to take part in the tour. Apparently, they found what they were looking for and attended the tour with their utmost ardor. They exchanged numbers with Keyhan so he can arrange workshops for them in near future. 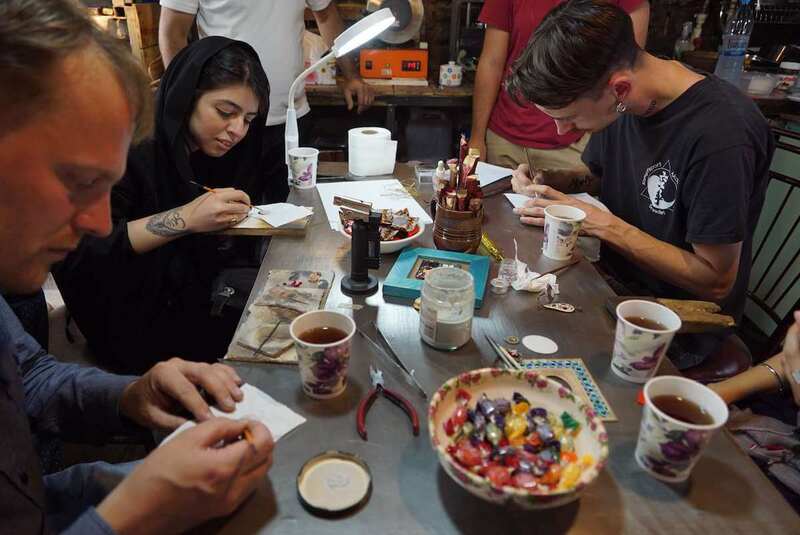 Another participant from Netherlands who was residing at the See You in Iran hostel and worked in jewelry and watch industries, said the modernized vitreous enameling is adopted in the production of watch dial in Europe and that made him curious about how Minakari is used in one of the pioneer countries of the art, Iran. After the workshop was finished we stuck around to chat with Kehyan about his works and there took place a delightful and engaging conversation between all of us who were from different backgrounds but were tied together at that specific moment because of one similar interest: the art of Minakari. سومین برنامه از پروژه ی See You for Today’s Art #3 که توسط مینا جزایری برگزار شد، شامل بازدید از ورکشاپ کیهان نبویه بود که طی آن برای شرکت کنندگان از پیشینه ی هنر میناکاری و لعاب صحبت شد و همچنین روندی که هنرمندان میناکار متقبل میشوند به آنها نشان داده شد و در پایان شرکت کنندگان خود این تکنیک هنری را تجربه کردند. میناکاری یا لعاب ، هنر روکش کردن بدنه های مختلف فلزی ، سرامیکی و سفالی با یک لایه ی شیشه ای رنگی است. این فرم خاص هنری در ایران به دوران حکومت اشکانیان و ساسانیان ( ۲۴۷ ق.م تا ۶۵۱ ب.م) بازمیگردد و حتی با وجود اینکه پس از سلسله ساسانی توجه ناچیزی به این هنر صورت گرفت اما خیلی زود در دوران حکومت سلجوقی دوباره رونق خود را بازیافت. کیهان هنرمندی پرشور است که در زمینه های مختلف هنرهای کهن مثل نگارگری ٫میناکاری ٫تذهیب و سفال تجربه دارد . او علاقمند به طراحی جواهرات با استفاده از تکنیک های معتبر و سنتی ایران است و از میناکاری برای تزئین جواهرات طلا٫ نقره و مس استفاده می‌کند.در پنج سالگی شروع به ساختن حلقه های چوبی تنها با یک چاقو کرد و خیلی زود در دوران تحصیلش در زمینه های مشهور هنر ایرانی استادکار شد. بازدید از کارگاه کیهان که بر روی پشت بام ساختمانی در حوالی میدان فردوسی تهران واقع است، در آن روز گرم تابستانی با شربت ایرانی خنکی به نام سکنجبین و شروع آشنایی با کیهان و همکارانش و خوش آمد گویی آنها همراه بود. کیهان از اینکه چطور سفر خود را آغاز کرده و یک هنرمند شده و چه موانعی را در زندگی چهل سال اش پشت سر گذاشته است برایمان صحبت کرد و از ابتدای طراحی تا انتهای روند کارش را به شرکت کنندگان نشان داد. سپس به هر شرکت کننده یک سکه برنجی داده شد تا اولین تجربه ی میناکاری خود را روی آن پیاده کنند بعد از قرار دادن سکه ها داخل کوره٫ سطح لعابی آماده بود تا روی آن را لعاب‌گذاری کنیم و بسته بر تعداد و تنوع رنگ و پیچیده‌گی طرح‌، سکه‌ها بارها و بارها در کوره قرار گرفتند تا تمایز رنگ آنها متمایز از هم شود. دو نفر از بانوان شرکت کننده دانشجوی هنر از تهران ادعا کردند که مدتهاست به دنبال این سبک میناکاری که کیهان استاد آن است بوده و حتی به دنبال این هنر تا اصفهان سفر کردند٫ ظاهرا آنها آنچه را که به دنبالش بودند پیدا کرده و با شوق بسیار در این تور حضور داشتند و در ورکشاپ های آینده کیهان نیز شرکت خواهند کرد. یکی دیگر از شرکت کننده‌گان از هلند که در هاستل See You in Iran اقامت داشت و در صنعت جواهر و ساعت کار می‌کرد برایمان از شکل استفاده ی مدرن لعاب برروی صفحه‌ی ساعت در اروپا گفت و اینکه همین مسئله باعث شد بخواهد در مورد نحوه ی استفاده‌ی لعاب در ایران. یکی از کشورهای پیشرو این سبک، بیشتر بداند. پس از اتمام ورکشاپ ما همچنان در کارگاه ماندیم و با کیهان درباره‌ی کارهایش صحبت کردیم؛افرادی با ریشه‌های متفاوت اما علاقه‌ای مشترک که در آن زمان خاص تجربه‌ی هنر میناکاری را باهم سهیم شدند. کیهان یکی از با استعدادترین هنرمندان در این زمینه است و در این حوزه جزو حرفه‌ای ها شناخته شده در عین حال که او همانند بسیاری از هنرمندان صنایع دستی با اشتیاق در رشته خود فعالیت می‌کند، بخاطر عدم وجود شرایط مناسب و حمایت ادامه‌ی این مسیر برایش سخت تر و سخت تر میشود. مینا جزایری یکی از اعضای تیم See You in Iran با راه اندازی پروژه ی See You for Today’s Art سعی دارد تا فاصله ی بین این هنرمندان ناشناخته و مخاطبانشان را از بین ببرد. Keyhan’s passion for reviving the techniques of archaic Iranian jewelry arts runs deep. 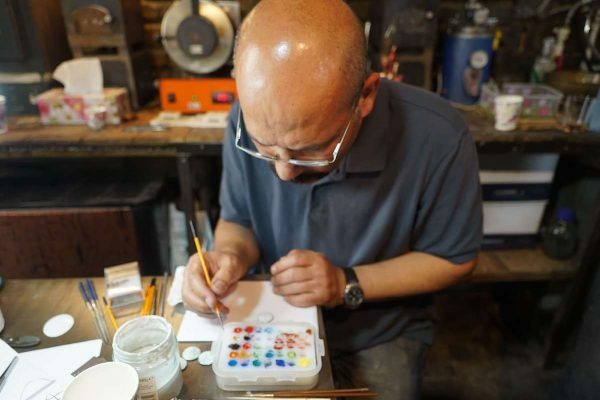 During the past 40 years he’s been researching and conducting experiments in different art fields such as ceramic and pottery, graphics and Iranian style jewelry. 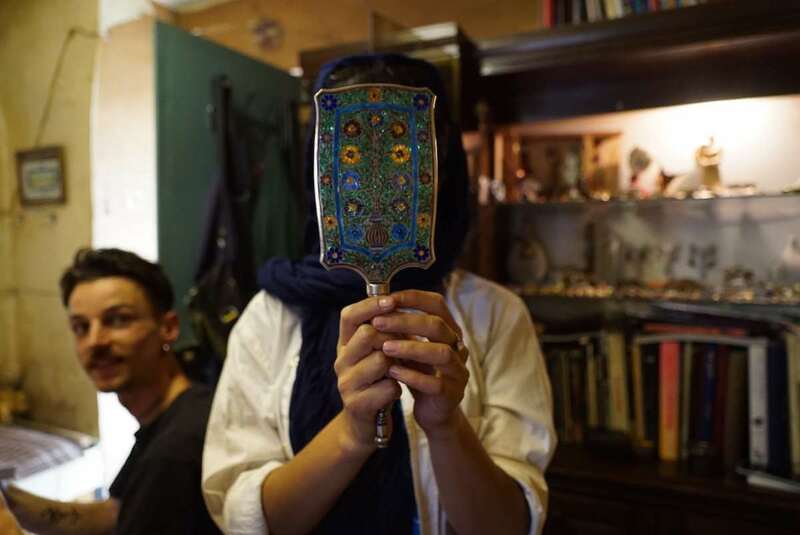 See You in Iran is proud to announce that the third See you for Today’s Art tour will revolve around Keyhan Nabaviyeh’s practical knowledge of ancient Iranian jewelry and related art forms. During this tour, which is organised by Mina Jazayeri, Kehyan will explain his journey of becoming a craftsman and what he’s stumbled upon throughout this 40 years long path. Tour attendees will meet at 15:30 on June 14th in See You in Iran hostel. 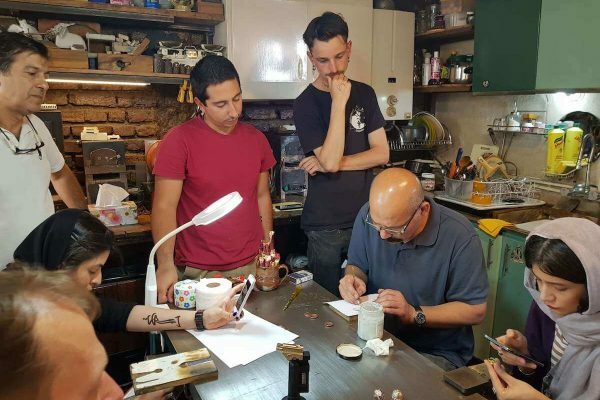 From there, they’ll walk to Keyhan’s Art studio around Ferdowsi square to hear his stories on how he got into the ancient Iranian art of Minakari (enameling) and jewelry making. 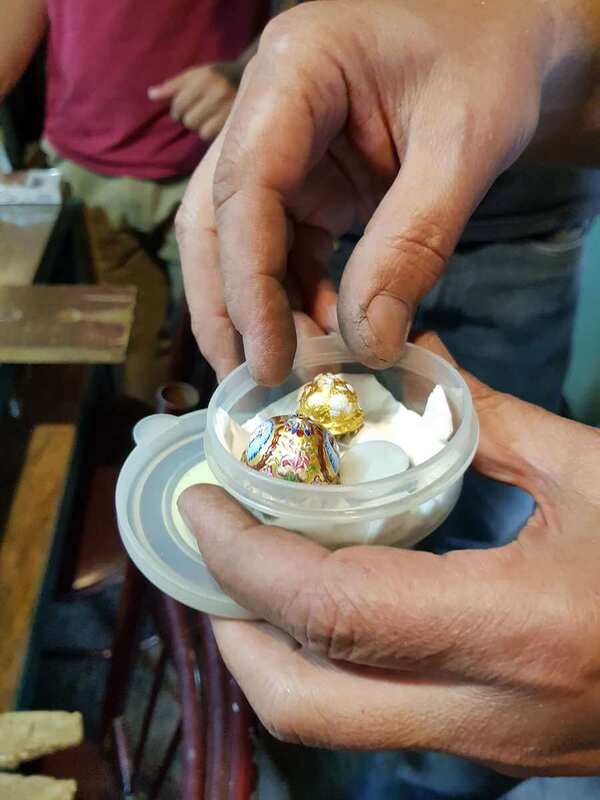 He will present Minakari and its production process and demonstrate different techniques of how this ancient style of jewelry is done today. 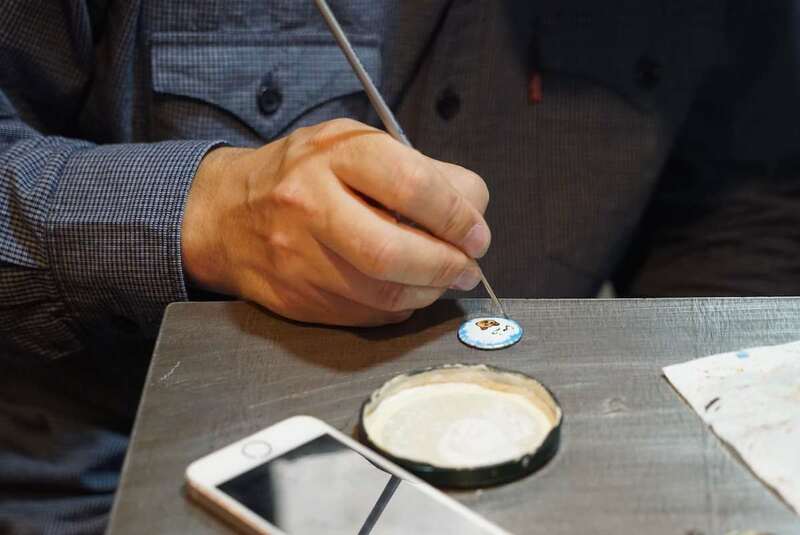 At the end of the tour, attendees will get some hands-on experience on a few jewelry making techniques under his supervision.